Tilted Horizons: 15% off Kermit Chairs! 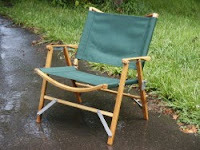 Get the camping motorcyclists' favorite chair at a 15% discount for the remainder of March. The Kermit Chair packs small and has a reputation for being indestructible. Various add-on options are available, too. The discount code is ADVRIDER 2010 - key it into the Special Instructions box. Call Tom at Kermit Chair Company (888-729-9836) with any questions.